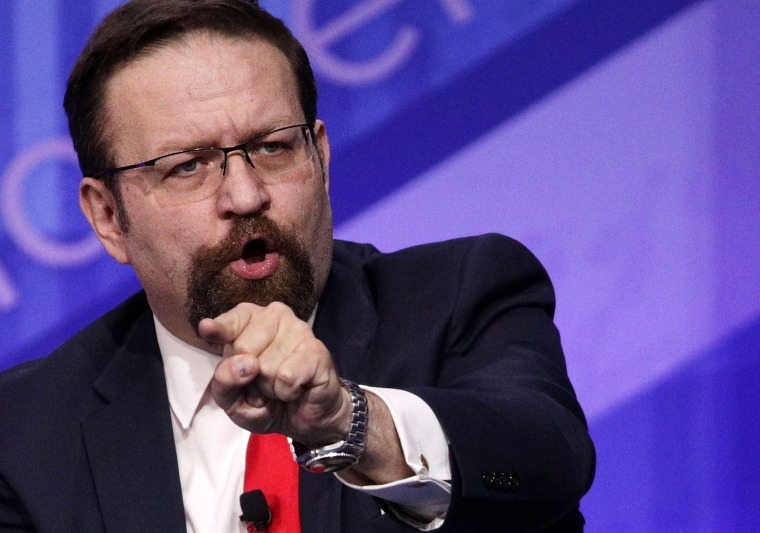 WASHINGTON — Sebastian Gorka, a national security aide to President Donald Trump and one of the most vocal hard-right advocates for a firm stand against Islam and for a pro-America foreign policy position, is no longer a part of the administration, a White House official said Friday. Whether Gorka resigned or was fired is unclear. One White House official said he resigned, and another said Gorka did not resign but confirmed he no longer works at the White House. The departure was first reported by The Federalist. The White House official told NBC News that Gorka resigned in part because with John Kelly in place as chief of staff, there was "no way" he’d have a policy role in the National Security Council. Gorka was hired as a counterterrorism adviser and has made regular TV appearances as an outspoken defender of Trump's administration. The combative adviser has been dogged by controversy ever since he attended Trump's inaugural ball in January wearing the medal of Hungarian Nazi-linked group Vitezi Rend. Gorka has repeatedly denied he was a member of the group and said the medal was his father's. The departure is the most recent shakeup in the Trump White House, and comes a week after Trump’s controversial chief strategist Steve Bannon left the administration. The different U.S. official told NBC News in May that Gorka has had no direct policy making role and was sidelined by National Security Adviser H.R. McMaster. APRIL 11: Who is Trump aide Sebastian Gorka?